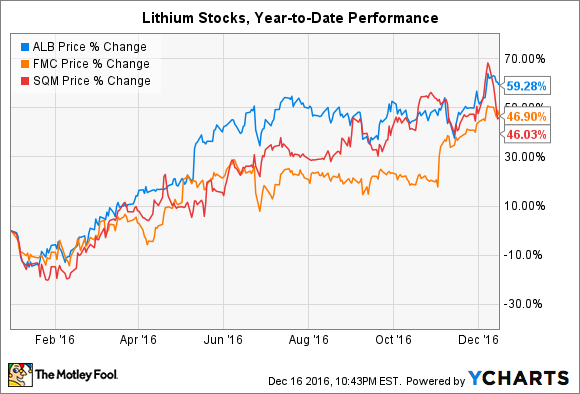 Do Lithium Stocks Belong in Your Portfolio? Despite the rapid growth of the lithium-ion battery market, interest in lithium stocks appears to be far outpacing the market realities for the material. The case for lithium stocks seems simple enough. The world is adding new portable electric devices at an incredible pace. Just about every major automaker has at least announced plans for introducing an electric vehicle to the market within a matter of years. A little company called Tesla is moving forward on construction of a Gigafactory that will produce an enormous number of batteries for autos and home-scale energy storage -- it expects to produce as many lithium-ion batteries in 2018 as were manufactured on the whole planet in 2013. Phones, laptops, power tools, wearables, drones -- it seems everything and anything is taking advantage of advances in lithium-ion technology. That means lithium stocks belong in your portfolio, right? As is usually the case, the details of the market make this simple argument a little more complicated. Here are a few things investors will want to consider before throwing money at the companies supplying this headline-grabbing metal. Everyone thinks of batteries when they think of lithium. However, while that is by far the fastest-growing use for the metal, batteries only account for about one-third of the total lithium market. They only became the largest category of consumption last year, when they moved ahead of ceramics and glass. Counterintuitively, global production of lithium ore hasn't grown all that much in recent years, although mining companies are planning on major output increases in the near future. The U.S. Geological Survey concluded that 2013 output topped out at 34,000 metric tons, then fell to 31,700 metric tons in 2014. Production of raw ore is estimated to have grown by just 500 metric tons in 2015. Sluggish production growth is not a matter of scarcity. Global output could triple and known reserves would still last about 135 years. The question is whether or not lithium suppliers can keep up (more on that below) with rising demand. This should be the focus of investors interested in lithium stocks. There are plenty of tiny, zero-revenue stocks out there claiming to have vast reserves of untapped lithium ore. These are the crazy Uncle Joes of the market. Smile, nod, and then turn your attention to the suppliers with real market share. Albemarle Corp. (NYSE:ALB), Sociedad Quimica y Minera de Chile (NYSE:SQM), and FMC Corp. (NYSE:FMC) own a combined 70% of the global lithium market. China's Tianqi Lithium owns another 16%. These diverse specialty chemical companies buy up the rights to unmined lithium and convert it into more refined grades that are suitable for downstream customers, such as battery manufacturers. These companies are only real way to gain exposure to the market. There is no reliable pure play lithium stock. Why not? Mining lithium is an awfully slow and laborious operation. Consider that some 80% of global lithium reserves are to be found in salt brines in South America, namely Chile and Argentina, with over half of the world's reserves residing in the former. Getting the raw lithium out of brine requires multiple concentration, extraction, and purification steps to separate out various other metal impurities. The first step alone -- solar evaporation ponds -- takes four months. The next several steps are energy and consumable intensive, which hikes the cost of production. To put it another way: Uncle Joe isn't going to make it in lithium mining. The process is long and expensive, which prevents suppliers from responding rapidly to shifts in demand. Only large companies such as Albemarle, SQM, and FMC have the financial power to withstand volatility, diversify their supply chains, and make the necessary investments to create high grade lithium materials for industrial customers. Of course, market volatility has worked in their favor in the last year. Now that I've convinced you to stay away from microcap lithium stocks, you're ready to load up on the blue chips. After all, the growing demand for batteries and the sluggish rises in raw ore output (a year-over-year increase in output of just 500 metric tons) must give the four major market players the upper hand in negotiating supply deals with battery manufacturers, right? It goes without saying that lithium is pretty important in lithium-ion batteries. But, counterintuitively, the lithium does not have a significant impact on the cost of lithium-ion batteries. In fact, it's actually the smallest mass and cost component of the battery cells. Earlier this year, two researchers at Carnegie Mellon University did a study that played around with the price of lithium carbonate (raw lithium ore), using a base price of $7.50 per kilogram. Dropping the price to $0 and increasing it to $25 per kilogram -- an increase of 233% -- changed the cost of batteries by less than 10%. *Includes other materials. **Income before taxes. Source: SEC filings. In its financial reports, Albemarle lumps lithium sales in with other advanced materials it sells, but lithium is clearly driving the segment. The year-over-year sales increase for the segment was all from favorable conditions in the lithium market, which offset declining revenue from other products. FMC has seen a significant leap in lithium sales compared to 2015, too, and has announced major expansion plans to increase output before the end of the decade. Investors will want to take the issues outlined above into consideration before making a decision to gain exposure to lithium, either directly through a supplier such as Albemarle or indirectly through an ETF. In the end, the lithium market is more complex than most people realize. I'm firmly in the camp that thinks lithium stocks are simply the flavor the week for Mr. Market and do not represent a long-term buying opportunity. Perhaps when supply chains mature and prices reach more of an equilibrium, I'll reconsider my position. But for now, lithium stocks do not belong in my portfolio.